Question: Soon there will be a convention in Kharkov. Which main thought should we be concentrating on? Answer: This thought must be a about achieving a very serious unity, where the upper Force will be revealed, which helps everyone see, feel, and understand how to actually advance. Regrettably, currently there is enormous confusion; people still do not understand what they need to do. And they will not understand it until they see and feel that they are on a spiritual level: the level of bestowal. They will have problems, complaints, and so forth. Question: Are you speaking about mankind or our groups? Answer: Primarily, I am speaking about our groups. Personally, I need to urgently lift my students to already begin working with them on a different level. I hope that our seminars, the upcoming fall convention, and the work in preparation for the convention and dissemination of our materials that we do over the course of this time, the round tables in the West, the US, and Israel—that all of this will result in our ability to enter then next level through our mutual effort. I am always waiting for this. And it is coming nearer. It is like jumping over an abyss, when you need to swing intensely, and only after will you be able to make a good jump. We are now swinging like a cat aiming itself before a jump. This is the state that we are in now. This has never yet happened in history because since the breaking of the Kelim, the vessels, we are the first ones to begin correcting. Question: Sо you have both an uneasy and happy feeling that this is about to happen? Answer: I simply know that this must happen, and I am concerned in a way, because I feel like the world is unraveling much faster and we must prevent the outcome of it. We can do this if we gather into one single Kli, a common desire, then the world will follow us. And everyone will suddenly reveal that there is a method, a group, an organization, which is able to give a new philosophy, a new model to the world. And if we fail to achieve this and will have no strength, mankind will also not feel anything. We must appear in this world as the carriers of a unifying, spiritual upper Force. And then the world will “smell” that we have it, and everyone will follow. This is why it is very important now to prepare many teachers, lecturers, and educators who need to complete seminars and courses of integral preparation, of unity, so they understand what this is about even though they have not yet attained spirituality. But we already want to have materials, a method, and for everything around to move towards it. I think that we will absolutely break through before the fall convention: The world will obligate us. There is an objective need here, and it is not for us, but for the world to advance forward. Once we really capture this spiritual potential, the entire world will immediately begin to feel it and advance because we all exist in one single field. Just like a charge in an electric field moves towards its source, its potential, in the same way, the entire world will suddenly feel that we have the solution to the problem; we will capture specifically this potential, this unity. It is not like something will convince everyone; people will not need words, they will simply wait: “Give us what you have!” They will turn to us with this demand. Question: Will the division into internal and external parts, between “Israel” and the “nations of the world” be kept when the whole world reaches the end of correction? Answer: No. The letters of the Hebrew word “Israel” stand for Li Rosh (I have a head). This is the order of the general correction—the one who is evoked and is given a special desire is called “Israel,” and he must take care of the whole world serving as the link between the Creator and the created beings. It isn’t an ordinary desire since the “point in the heart” manages it by the connection with the Creator. The attribute of bestowal was inserted into this desire, the posterior of Nefesh of Holiness. This is the meaning of the “Israel,” Yashar – El (straight to the Creator). It isn’t about certain people, but rather about a special type of desire that is connected to the Creator since it has the discernment of what bestowal is. Although it is concealed and shattered, it still exists. How can the desires in which this spark, this discernment of bestowal, doesn’t exist be corrected? It is possible if they add Israel as their “head;” if the two parts connect and work together. The whole world is the essence of the desire to receive that must be corrected. But it can only do it through connection with another desire in which there is a spark of bestowal. Therefore the “nations of the world” are not required to correct themselves. On the other hand, they feel sorrow and pain since “Israel” doesn’t correct them. This is where the hatred that the world feels towards Israel stems from. Of course, no one perceives it, but subconsciously, according to their nature, these people feel it and express their claims openly. The correction is the role of those who belong to “Israel.” They have to correct their attitude towards the nations of the world as soon as possible. Actually, there is nothing to correct in “Israel” themselves, except for the part of the “nations of the world” in them. If “Israel” process these desires in them correctly, they will understand how to treat others. Speaking in Kabbalistic terms AHP de Bina explains to Bina how it should treat ZON. Thus we must first correct “the nations of the world” in us, our external part, which will allow us to connect with the internal part of the world. This is the order of correction. It is our duty, and if we don’t make efforts to carry it out as soon as possible, troubles are soon to come. The time has come, and the nations of the world will begin to pressure us since the mutual inclusion that was created as a result of the exile allows them to feel that Israel owe them. It says: “Why was it called Mt. Sinai? Since the hatred of the nations of the world descended from it.” “Since Israel received the method of correction. So where do all our troubles come from? From Israel, since they do not fulfill what they have received.” The Torah, the method, obliges us immediately, while the upper force manages the nations of the world, and so their hate is justified. But we are advancing “against the current,” hoping that the troubles will go away by themselves without correction on our part. It’s nonsense. After all, we are dealing with the force that evokes the correction. We mustn’t even ask or pray that the hatred that nations of the world feel towards us will disappear from the world; we should only exert ourselves so that it will be corrected. Here too, it isn’t because it’s an unpleasant phenomenon, but on the contrary, we have to be thankful for it since it evokes us to turn to the Creator. Baal HaSulam, “The Arvut (Mutual Guarantee)”: Hence, only the members of the Israeli nation were admitted into the required Arvut, and not the nations of the world at all, because they did not participate in it. This is how the desire to receive began to split. In ancient Babel, one nation lived that later began to split up into separate groups that spread all over the globe since the upper force didn’t hold them together anymore. This dispersion meant that the desires to receive discovered the differences between them. The different desires which belong to different levels like “Syria,” “the trans-Jordan,” “the Land of Israel,” “Egypt,” etc. began to appear. To the extent that they were revealed, we felt ourselves more and more separated until we discovered to what extent we are still connected to each other internally. Today, in a time of total destruction of the old tower of Babel, we discover how destructive our ego, the source of all our troubles, is and how separated and distant we are from one another. Thus the dispersion of the Babylonians ends—each one wants to live separately without any obligations to others, and at the same time, it turns out that in order to survive we will need a general mutual connection. Because of our dependence on it, we feel that we have to reconnect, but how? By feeling the necessity to build a new tower of Babel, we build it by correcting ourselves to bestow. Eventually we will become one nation again and will build the “tower that is full of good” and reach Heaven. “’Once females begin to show preference for being provisioned, the low-ranked males’ investment in female provisioning over male-to-male competition pays-off,’ Gavrilets explained. Gavrilets says that the study’s results describe a ‘sexual revolution’ initiated by low-ranking males who began providing in order to get matings. ‘Once the process was underway, it led to a kind of self-domestication, resulting in a group-living species of provisioning males and faithful females,’ he said. My Comment: The true guardian of family values is the man who doesn’t forget to buy food on the way home, but not the one who reigns over the entire family. And within the family, evolution leads us to unity, but not to dominion. Question: If the correction begins with people who have a “point in the heart,” then why do we turn to all of humanity now? Answer: We operate in two parallel “fronts,” since the “nations of the world,” who don’t have a point in the heart, will provide us with the necessary deficiencies by which we will understand how to correct ourselves in order to be adapted to them. It is like a married couple that is not considered a family until they have children; they are not a real family since nothing ties them together. In fact they are still children, although they are married. It is the offspring they share, the obligation to raise their children, which makes them parents. It is the same with us: If we don’t take upon ourselves the work of being the link between the Creator and the nations of the world, then we will not be able to be “Israel.” Only carrying out this mission directs us Yashar-El, straight to the Creator. So we have to stabilize the whole picture in order to start our self-correction. Since it is “first think, then act,” we need the whole plan now. It isn’t by chance that Baal HaSulam went to Poland in the 1930’s to check whether it was possible to evoke the local workers to correction as if everything was perfect in the Land of Israel and only the Poles were missing. The picture has to be as whole as possible. We will not understand how to correct ourselves if we don’t go out to the people both in Israel and all over the world. This is also how children “teach” and stabilize their parents. The connection with those who need your care stabilizes you and shows you how to organize yourself internally. From Rabash’s lesson: When a person is naked, he feels a deficiency, and that’s why clothing for him is like filling that covers his deficiency. In spirituality too, an empty desire feels that it is deficient. When the Light comes and fills it, it is like clothing. Clothing is the level of compatibility of the desire to the Light. The clothing can be inanimate, vegetative, animate, or different human characters—all this is the clothing a person has, which determines which attributes of the Light the desire can adopt by dressing in it in order to resemble the Light. Our main work is to yearn to become a clothing on the upper one, to receive a form that is the most compatible with the Creator. We should constantly prepare ourselves to take on a new form. Everything is determined by the clothing because the desire itself has no form. It depends on the clothing, whether a person will be a beast or a human who resembles the Creator; it is one of the two. On the way we should constantly see ourselves in a state of free will, half guilty and half innocent according to the clothing, according to the form I am inclined to. In order to do that I have the group, the teacher, and the books, which can attune me to a clothing, a form that is as similar to the Creator as possible. Question: Why does humanity oppose its part that yearns for bestowal? Answer: This opposition is clearly understood. It is because there is a point of Light (•) in this part of the general desire. On the whole, a great gap is formed (Δ) between the desire and the Light, which leads to hatred. Deep internal mechanisms operate here; they are on the level of nature’s internal forces in which the Lights and the vessels operate. 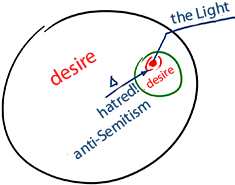 Unless we correct the other desires so that they will also resemble the Light, this hatred, this anti-Semitism, will not disappear. Moreover, it will keep growing in order to push us to corrections. Answer: If you accept is as a reason to escape suffering, it will be a very coarse and corporeal stimulus. But if you accept it willingly as an incentive to act, you will succeed. It all depends on your point of view. One way or the other, there is no reason to complain that the nations of the world are anti-Semitic. On the contrary, the correction can only come from you, and it will be right if you make an effort not to make anti-Semitism disappear, but rather use it for the correction of the world so that the Creator will be able to reveal Himself in all His parts.